Coinage, like many other expressions of cultural life, was far too closely bound up with religion in the Muslim period. Thus we find the Muslim creed, the Kalima, is mostly used on the coins as an essential feature thereof. One of the earliest Muslim issues was by Mahmud of Ghazni who introduced coins with Kalima. Mahmud Ghazni began raiding the Indian territories on a regular basis between 1001 and 1021 A.D. and established a Ghaznavid province in Punjab consistent with his Afghan territories in 1028 A.D.
Mehmud Ghaznawi, the early Muslim invader of India, has been portrayed by historians as iconoclasts, who were virulently anti-Hinduism. However, their coins tell an altogether different story. While the portrait of the king and other pictorial representations occupied the faces of coins in pre- Muslim periods, the Muslim period shows a conspicuous absence of the same with a few exceptions, the engraving of images being forbidden by the faith. He issued coins with the Kalima (Islamic expression of faith) inscribed in Arabic with the title ‘Leader of the faithful’ on the obverse. His Indian coins have reverse inscriptions stating ‘Dinara struck for cities captured during the Holy War with India’. 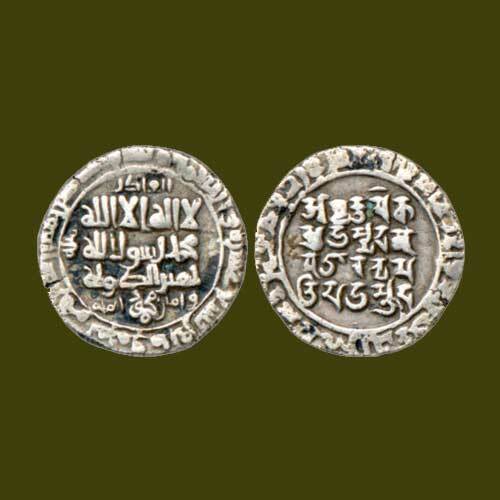 One Silver Dinara issued by Mahmud in 1028 A.D. from Mahmudpur (Lahore) has a unique bilingual legend with the Kalima in Arabic on the obverse and its translation in Sanskrit on the reverse! Mahmud Ghazni had placed the true translation of the Kalima in Sanskrit and in Nagari characters the language and script of the infidels and the kafirs that is the Hindus. The Sanskrit inscribed in Sarada script in the main field of the reverse amounts to a translation of the kalmia, which reads: “avaktam ektam muhamadah avatarah nrpatih mahmudah” (There is one unmanifest (or invisible), Muhammad is the avatar, and the king is Mahmud. In the margin, the Bismillah is translated as “avyaktiya” name (in the name of the invisible).